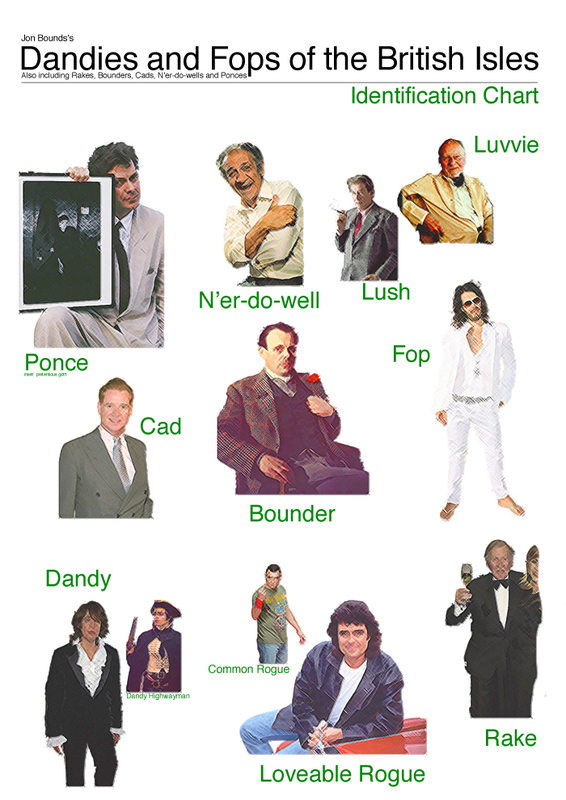 With huge inspirational thanks to a drunken discussion with Pete Ashton, Fiona Cullinan, Michael Grimes, Mark CyBrum and Alex Hughes (I think, I was drunk…) I present an identification chart to all of the well dressed and non-so well intentioned members of society. This entry was written by Jon Bounds, posted on 18 January 2010 at 12:06 am, filed under art, my projects and tagged Dandies, Fops, lush, luvvie, n'er-do-well, ponce, rake, rogue. Bookmark the permalink. Follow any comments here with the RSS feed for this post. Post a comment or leave a trackback: Trackback URL.